"Pop-ups have become a regular part of the business model for a lot of high profile destinations and the promenade is an ideal spot for most brands." — Rob York, retail consultant for Downtown Santa Monica, Inc. They're here. They're weird. Get used to it. That's the message to city officials and downtown property owners when it comes to pop-ups, also known as "flash retail." Once considered an anomaly in merchandising, pop-up shops, some of which remain open for a year or as short as one or two days, have been embraced by adventurous brands and household names alike as a legitimate way to generate buzz, test out new products or new markets, build brand awareness and loyalty amongst consumers, and drive sales. Pop-ups are now estimated to be a $50 billion industry, according to the American Marketing Association, and one that figures to gather momentum as social media and technology play a more prominent role in marketing campaigns and e-commerce, respectively. Local regulatory and logistical hurdles can scare away brands, as well as property owners, from engaging in pop-ups. Currently, opening a pop-up requires many of the same permits and approvals as a permanent location and can take just as much time to open. Leasing to a long-term tenant offers more assurances for owners and often more rent per month. But pop-ups do have their benefits, chief among them are breathing new life into a shopping district and attracting new clientele. That is why Downtown Santa Monica, Inc. is working with city officials to streamline the process and embrace flash retail as a way to ensure downtown remains an attractive place to open a business, as well as shop for the latest fashions and other goods and services. The Third Street Promenade has hosted several pop-ups over the last year, from the most recent Nesquik activation celebrating the 70th birthday of the beloved chocolate powder mix, to the fanatical "Reputation" experience to coincide with popstar Taylor Swift's stadium tour of the same name. Google, Calvin Klein, Sony Playstation, Diet Pepsi, and Active, an extreme sports retailer, have also hosted pop-ups on the world-famous pedestrian mall. Some brands did not have a physical presence anywhere, but were simply testing the waters to see if they wanted to make the transition from online. Fans of popstar Taylor Swift were able to take pictures with props used in her music videos, as well as purchase merchandise from her "Reputation" tour. "Pop-ups have become a regular part of the business model for a lot of high profile destinations and the promenade is an ideal spot for most brands," said Rob York, retail consultant for Downtown Santa Monica, Inc. "We have a great deal of foot traffic, so you are reaching not only sophisticated and trend-setting Santa Monicans, but also people from all over the country and the world. You are tapping into a lot of media influencers and the creative tech minds driving trends and innovation. You know that if you open up on the promenade and present a fun, unique, engaging experience that you are going to earn a lot of exposure via social media. That reach can oftentimes go further than a billboard of traditional media campaign." And oftentimes at a more reasonable cost. Experiential flash retail has existed for hundreds of years, from the Vienna December market in 1298 to modern-day Halloween costume shops and seasonal farmers markets. However, pop-up stores started to become more mainstream in the late 1990s and early 2000s. The first generation of stores took on a consciously makeshift quality, often occupying vacant mall spaces and abandoned storefronts. A tumbling commercial real estate market, and soaring vacancy rates, accelerated the trend as accommodating landlords became more willing to negotiate short-term leases to help cover their mortgages, according to research by CradlePoint Technology, a company specializing in mobile and cloud computing technology that facilitates online shopping. The Ritual Expo was one of the first iterations of the modern pop-up retail store. Not yet referred to as pop-up retail, the 1997 Los Angeles event was created by Patrick Courrielche, dubbed the pioneer of pop-ups, and was later branded as a one-day "ultimate hipster mall." The event quickly caught the eye of large brands that saw the potential of creating short-term experiences to promote their products to target audiences. AT&T, Levi-Strauss, and Motorola worked with Courrielche to create pop-up shopping experiences across the country to market their products to young audiences. For Nesquik, the decision to explore an experiential pop-up on the promenade made sense, even if it was the brand's first foray. So many people have grown up with Nesquik chocolate powder that the brand wanted a way to bring them all together in one space that allowed them to better engage with Nesquik and its ubiquitous bunny mascot. The pop-up featured a slide and ball pit, four fun scenes for social media pics and posting, a milk bar with the classic and one-off flavors, as well as a lounge complete with a record player, antique television and vintage advertising. They also partnered with celebrity chef Jordan Adino, who grew up on Nesquik and developed recipes incorporating the product to coincide with the pop-up. "[Downtown Santa Monica] has great weather, great foot traffic and the promenade is the perfect location because of that. I was very excited that we landed a spot there," said Jackie Jimenez, marketing manager at Nesquik. Jimenez worked closely with a marketing firm to develop the right experience for Nesquik. A brand must be confident that elements of the pop-up align with their promise to loyal customers and the brand's overall philosophy, and that people hired to work at the pop-up exhibit the qualities of that brand. That can be tough when you are hiring temporary employees who have no attachment to the company. And then there are the logistics. Opening a pop-up can be as complicated as running a small circus, jumping from town to town, sometimes staying for only a few nights before packing up and doing it all over again. Physical elements have to be flexible enough to fit into different retail spaces, and durable enough to withstand the constant build out and tear down. If merchandise is involved, setting up the point-of-sale system and the accompanying technology also comes into play. A way to make it easier for brands and marketing agencies specializing in pop-ups is to remove some of the layers for approval. The city has done some of that already. Planning Director David Martin said signage for Google and Nesquik pop-ups was approved by city staff and did not have to go before the Architectural Review Board, which can delay the opening by weeks if not months. "The code is flexible enough to where a transition from one retail use to another is allowed," Martin said. "If there is something else that is identified that is standing in the way, we want to know about it and consider whether or not we need to make some kind of code amendment. We are trying to make it easy so as not to discourage people doing these. We want to see them." DTSM, Inc. will continue to work with the city to identify more ways to streamline approvals and help property owners interested in exploring shorter-term leases learn how the process works and what they can do to prepare their properties so pop-ups can build out their operations faster. "Pop-up stores and short-term experiences are typically facilitated by marketing agencies, not real estate professionals, which means word of mouth about the experience of getting up and running in Santa Monica plays a big role in determining which other pop-ups are interested in our market," said DTSM, Inc. Deputy Chief Executive Steven Welliver. "We will continue to advocate for streamlined permitting for pop-ups while also educating property owners about the potential for pop-ups in their locations." The benefit of hosting pop-ups is clear. For property owners, flash retail brings in cash when perhaps the space would have remained vacant. It also allows them to showcase their vacant properties to brokers and brands that may be looking for permanent locations, as well as marketing agencies on the hunt for pop-up spaces and landlords who are familiar with the process. Once a property owner gets on these marketing agencies' radar, they are more likely to see repeat business. That is certainly welcomed at a time when some storefronts are remaining vacant for months or, in some rare cases, a year or two. From a marketing perspective for Downtown Santa Monica and the Third Street Promenade, pop-ups provide a new reason for consumers to visit the district. That could lead to a dinner, a movie or perhaps a spontaneous purchase. They also add to the pedestrian experience, turning a vacant storefront window into something eye-catching. 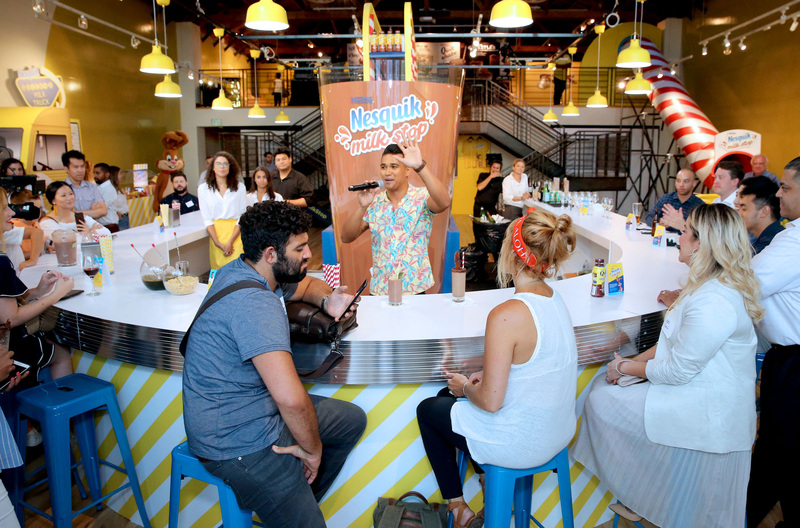 Guests to the Nesquik pop-up on the Third Street Promenade were treated to special recipes by celebrity chef Jordan Adino. "These are experiences you don't see everywhere, and depending on what the brand is, they can appeal to a wide cross-section of people," York said. "That may mean people coming back to the promenade to check it out who may have not visited in a while. It keeps the area in the forefront. And it's fun for the people who live here." Kevin Herrera is a former journalist turned marketing and communication expert, beer enthusiast, cyclist, cultural observer/commentator and expert on all things Downtown Santa Monica. He is currently the sr. marketing & communication manager for Downtown Santa Monica, Inc.